Highlights of Tompkins Square Park. Like many other New York City public squares, Tompkins Square Park was originally used as a place where military commanders could review troops marching in formation, in this case the 7th Regiment, as you need a wide, flat space for that. Between 1836 and 1850, what had been a swampy and unstable area was gradually graded and landscaped, with some sycamore trees planted (most were chopped down when the Regiment arrived in the 1860s but some, on the outer edge of the park, survive). 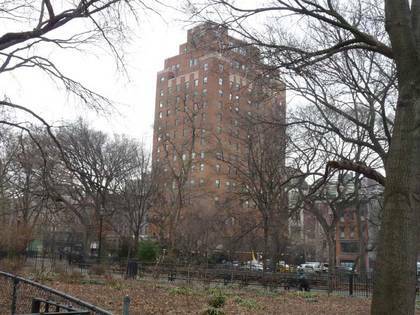 The park did not become a public area until 1878; like many other NYC locales and streets, it was named for NYS Governor, then Vice President Daniel D. Tompkins, who was from staten Island; he is buried in St. Mark’s churchyard, a couple of blocks away. In the 1950s and 1960s, there was a gradual deterioration in NYC’s public spaces, as funds dried up and there was a general attitude on the part of our representatives for deferred maintenance. Everything came to a head in the summer of 1988, when the Koch Administration decided to forcibly oust the drug dealers and homeless that had largely “occupied” the park, and a riot ensued. The necessity of the force used by the NYPD is debated to this day, but the cleanup was the first shot in the battle between the longtime residents of the East Village and gentrifiers, who have gained the upper hand in the nearly 30 years since the so-called Tompkins Square Riots. In 1988, the Christodora House on Avenue B and East 9th was the focal point for what longtime East Village residents saw as a battle between the status quo with affordable rents and a future of the rich moving in and pushing them out, as it was one of the first buildings in the area to be redeveloped as a condominium. It had been built in 1928 as a settlement house and had been used by community groups until that time, providing food, shelter, medical treatment and education to nearly 5,000 locals every week. It had a third floor concert space where George Gershwin gave one of his first public recitals. 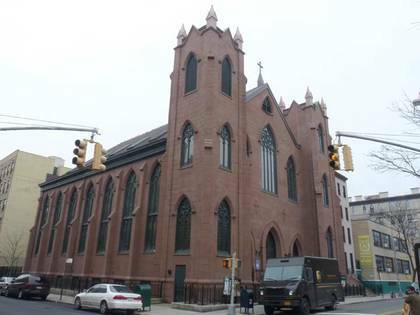 In the mid-2000s, it appeared that St. Brigid’s Church, built in 1848 and which had deteriorated nearly to the point of no reurn, would be razed; however, an anonymous donor swooped in with a $20 million donation which is paying for a good part of what has basically become a reconstruction job. In its early years St. Brigid’s served a community of Irish immigrant East River dock workers. It was designed by prolific Catholic church architect Patrick Keely. Compare St. Brigid’s restoration to what happened to St. Saviour’s Church in Maspeth, which was constructed in 1847 with a design built by famed architect Richard Upjohn. No angel appeared with a cash donation, and after the property was sold, St. Saviour’s was disassembled and awaits a restoration… somewhere, someplace. 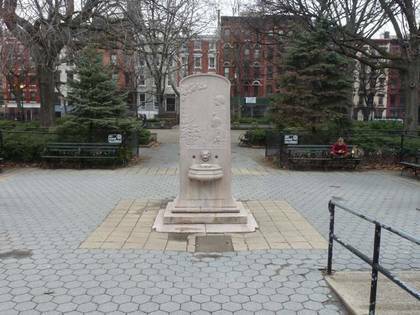 In 1906, a 9-foot tall monument to the victims of the June 15, 1904 General Slocum steamboat disaster in which 1,000 people perished due to gross negligence on the part of the boat operators was erected in Tompkins Square Park: a small, 9 ft. stele made of pink Tennessee marble, featuring a relief picturing two children looking seaward, sculpted by Bruno Louis Zimm. Funds were provided by the Sympathy Society of German Ladies. In 1991, it was restored by the NYC Parks Department with funds from SUNY-Maritime College in Throgs Neck, Bronx. The children are described: “They were earth’s purest, children young and fair.” A larger monument can be found in Lutheran All-Faiths Cemetery in Maspeth, Queens. 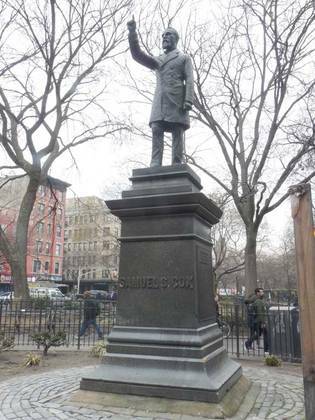 Louise Lawson’s sculpture of Ohio Congressman Samuel Sullivan Cox has stood at Tompkins Square’s southwest corner at Avenue A and East 7th Street since 1924, after its initial placement at the triangle formed by Lafayette Street, 4th Avenue, and Astor Place in 1881. S.S. Cox (1824-1889) was a Democratic Party member of the House of Representatives from Ohio from 1857-1865, and from New York from 1869-1889, when he retired. He championed the Life Saving Service, which patrolled the coast looking for shipwreck survivors; the Service became part of the US Coast Guard in 1915. He is remembered with a statue, placed while he was still in Congress, for his involvement with the US Post Office. He introduced legislation that assured paid benefits, 2 weeks’ vacation, and a 40-hour work week—progressive in that era—for postal workers. Letter carriers from 188 cities inscribed on the monument raised $10,000 for its creation. Cox’ statue stands across the street from a likeness of a man from a completely different place and time. John Mellor, known professionally as Joe Strummer (1952-2002), was the founder of “The Only Band That Matters,” the Clash. Of British parentage, he was born in Ankara, Turkey, as his father Ronald served in the British foreign service. The Clash was of the most overtly political, explosive, and exciting bands of the late '70s and early '80s, with their music taking on Nazism, racism, unemployment, and police brutality. They achieved success in the US with the double LP London Calling and singles such as “Train in Vain” and “Rock the Casbah,” but their chief legacy was as a killer live act—they played the old, non-air-conditioned Bonds clothing store in Times Square for 17 straight days in June 1981, one of which I attended, though I know people who were at all of them. After the Clash’s breakup, Strummer did solo work and also played with the Pogues and the Mescaleros. He died of heart failure at age 50, but his legacy remains his huge heart. 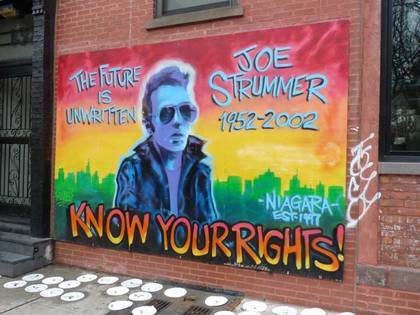 The artwork here at Avenue A and East 7th Street was originally painted outside the Niagara, a bar Strummer frequented, in 2003, several months after his death, by graffiti artists Dr. Revolt and Zephyr. When the wall was in danger of collapse and had to be replaced in 2013, the artists were called back in to create a new mural. The artists renew the memorial every so often.